North Korean leader Kim Jong Un may have been too busy visiting a potato farm to meet with U.S. Secretary of State Mike Pompeo, Pyongyang's state media implied Tuesday. The North's state media normally lead their television bulletins and front pages with Kim's doings, but a seven-day absence from the headlines, including during Pompeo's recent visit, had prompted speculation on his whereabouts among Korea-watchers. [post_ads]The mystery was perhaps resolved Tuesday when the official news agency KCNA put out no fewer than four reports on Kim's trip to far-flung Samjiyon county, on the border with China, most of them far more detailed than its usual accounts of his "field guidance" visits. 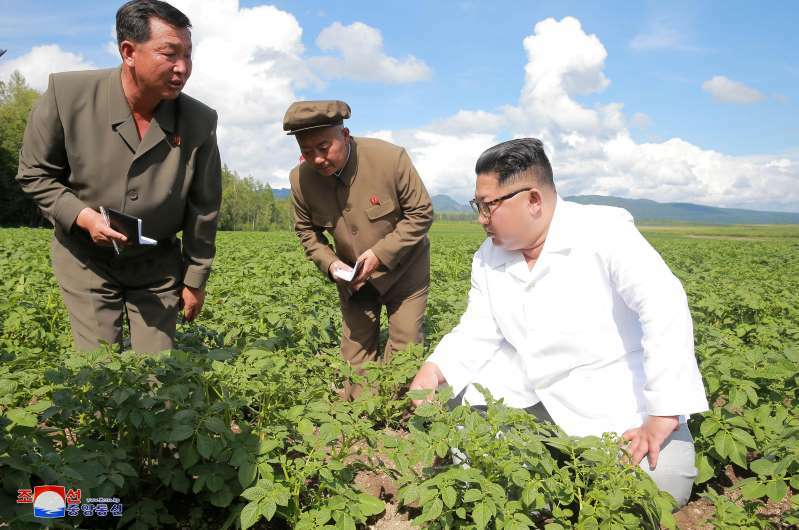 At the Junghung potato farm, it said, he instructed staff not only to plant high-yield varieties but also to "introduce various species good to taste and ensure the quality of processed potato foods in production and thus raise the quality of potato production." He praised officials of the county, which is close to Mount Paektu, the spiritual home of the Korean people and claimed by Pyongyang's propaganda to be the actual birthplace of his father and predecessor, Kim Jong Il. It was "a sacred land of the revolution," Kim said, which authorities were seeking to build "into a model of the country and fairyland of communism." KCNA did not say when the trip was made, but Kim Yong Chol, Kim's powerful right-hand man, told a visiting Seoul official last week that the leader was away for a trip to a "local region." Pompeo was in Pyongyang from Friday to Saturday to try to flesh out a bare-bones deal on denuclearization made during last month's historic summit between Kim and President Trump. The White House had said Pompeo would meet with the leader, but the encounter did not materialize, and the top U.S. diplomat only met with Kim Yong Chol. Pompeo insisted the talks were making progress, but as soon as he left, the North's foreign ministry berated him over his "unilateral and gangster-like" demands and for offering no constructive steps on the U.S. side. But Mr. Trump tweeted Monday that he has "confidence" that Kim would honor the denuclearization "contract" they signed at the summit and accused China, the isolated North's powerful neighbor and ally, of seeking to undermine the deal. "I have confidence that Kim Jong Un will honor the contract we signed &, even more importantly, our handshake," Mr. Trump wrote on Twitter. "We agreed to the denuclearization of North Korea. China, on the other hand, may be exerting negative pressure on a deal because of our posture on Chinese Trade-Hope Not!"